Goodreads says, "Everyone at Hundred Oaks High knows that career mentoring day is a joke. So when Maya Henry said she wanted to be a rock star, she never imagined she’d get to shadow *the* Jesse Scott, Nashville’s teen idol. But spending the day with Jesse is far from a dream come true. He’s as gorgeous as his music, but seeing all that he’s accomplished is just a reminder of everything Maya’s lost: her trust, her boyfriend, their band, and any chance to play the music she craves. Not to mention that Jesse’s pushy and opinionated. He made it on his own, and he thinks Maya’s playing back up to other people’s dreams. Does she have what it takes to follow her heart—and go solo? Music is Maya's life and has always been, except for the day that she is kicked out of her band and her boyfriend dumps her. She could use some good luck. It appears her luck is changing when she gets her assignment for Career Shadow Day. She gets to shadow the Principal's nephew, Jesse Scott, otherwise known as a country music superstar. The thing is....Maya isn't into country music. She likes edgier rock, but at least she can learn something from him about the music industry, right? However, once she meets Jesse, he doesn't treat her like she was hoping for; he treats her like just another one of his groupies. Jesse is currently dealing with his own set of problems and as he gets to know Maya more and more, he realizes that they perhaps have more in common than he initially thought. But more importantly, does Maya have what it takes to follow her dreams? 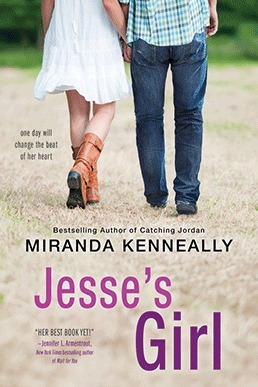 Miranda Kenneally's Jesse's Girl is a cute summertime read; it's a perfect addition to your beach bag this summer. I love that Maya is the kind of girl that goes her own way in Jesse's Girl. Most people would expect her to love country music, but she's got her own thing going on with her rock music and 80s music. Being a child of the 80s, I loved that! Once she pairs up with Jesse for Shadow Day, things start to get really interesting. At first, there are some bumps in the road with Jesse, but I enjoyed how their relationship played out. I also liked that they are both trying to figure things out in their own lives and ended up challenging each other. I had a hard time buying into the Career Shadow Day and Maya's incredibly good luck being placed with Jesse. It seems a little too good to be true, even if Jesse did it as a favor for his uncle. However, my experience in public education is perhaps way different than Maya's; nonetheless, I had a hard time buying into the fact that a country music superstar would allow a high school student to shadow him. Fans of Kenneally's Catching Jordan will love that some of her former characters make cameos in Jesse's Girl. I adored Catching Jordan, so revisiting the characters was a lot of fun. Jesse's Girl didn't blow me away by any means, but it's perfect summer reading. It's light, it's fun, it's romantic, and if you are like me and enjoy country music, you'll love the combination of music and romance. I haven't read any of her books yet but this sounds like it would be fun. I like the emphasis on music. Me too...incorporiating music is always fun, except I liked Catching Jordan a bit better...love football! I wasn't completely sold on the "Shadow Day' either, which really stuck with me the whole way through. Your experience following the music teacher seems way more realistic. Thanks for visiting, Christina! I know, right?! Me too. Loved that aspect of Maya. Thanks for visiting, Jenny! This is definitely one of the better reviews I've read about this book. Most people didn't have great things to say about it. I still kind of want to read it, so I'm glad you thought it was a good summer read! Really? I read some really good reviews. I think my review is sort of a middle of the road review. I definitely didn't like it as much as Catching Jordan. It was still a good summertime read though! Thanks for visiting, Amber! I know! You are so right, Joy! Thanks for visiting! I have this, but haven't read it. In fact, I think I have a few books by this author and have yet to read any of them. Oops. It is pretty unrealistic that a superstar would have anything to do with this, but I think most teens (and some adults) fantasize about having a star fall for them, so of course it's popular! Great review! Exactly. I can see how many teens would love this idea of a celebrity falling for them, but me being a realist...I didn't really buy it. Ha. Thanks for visiting, Natalie!